I have addressed the fifth edition rules for using a shield in a previous post (HERE). But I recently had a player ask if he could use a spiked shield. I couldn’t think of a good reason that he shouldn’t be allowed to do that, but the rules as written don’t specifically address the issue. Time for a new house rule. I soon realized that to do this I really needed to re-examine all of the rules for attacking with shields. What I came up with is a redefining of a normal shield – when it is used as a weapon – as well as spiked shields and a couple of other issues. Simple weapon: Normal shields can be used as simple light melee weapons. Damage: 1d4 + STR bonus (bashing). Proficiency: You are only proficient with normal shields used as weapons if you are proficient with all simple weapons. Martial weapon: A spiked shield is a light martial melee weapon. Damage: 1d6 + STR bonus (piercing). Proficiency: You are only proficient with spiked shields used as weapons if you are proficient with all martial weapons. They can still be used as an improvised weapons, doing 1d4 + STR bonus damage. The damage type will be bashing for normal shields, or piercing if it is a spiked shield. Using a shield to make an attack doesn’t deprive you of the +2 AC bonus. You do not gain a +1 bonus to AC while you are wielding a shield (spiked or not). The Basic Rules for Dungeons and Dragons are available as a free pdf download from Wizards of the Coasts. If you don’t have yours yet they are available here. I am very excited about these and will post a full review later. For now, here is something I hope you will find helpful. 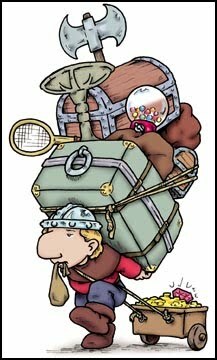 The rules for encumbrance is a variant. However, if you choose to use them it would help if the weight of the various equipment packs were listed in the D&D Basic Rules. I have added up the weight of each of the individual items in each pack and have listed them here. These weights assume a full waterskin, for the packs that contain one. You can subtract 5 lb. for an empty waterskin. Just out of curiosity, I also added up the cost of the packs if the items were purchased separately. It turns out that most of them really are a bargain, so if you like most of the items they contain, you may as well go with a pack. The Priest’s Pack contains items that are not listed for purchase separately. Here are the values I used. This assumes a small knife cost 2 gold pieces and a little bag of sand is 1 lb. If you ever need to quickly equip a character, here is what I use in my D&D Lite house rules. Your character has one outfit of normal clothes. Your can ignore the weight of your clothing when calculating the weight you are carrying. This will typically include sturdy boots, leather breeches or a skirt, a belt, a shirt (perhaps with a vest or jacket), gloves, and a cloak. The clothes have plenty of pockets (especially the cloak). The outfit can also include any extra items you might need, such as a scarf or a wide-brimmed hat. Your character has this equipment: backpack, waterskin, one day’s trail rations, bedroll, sack, flint and steel, and three torches. Add to this the equipment and money listed below for your character’s class. Barbarian: Studded leather armor, greataxe, shortbow, quiver with 20 arrows and 8 gp. Bard: Studded leather armor, longsword, light crossbow, case with 10 crossbow bolts, lute (common), spell component pouch and 8 gp. Cleric: Scale mail armor, heavy wooden shield, heavy mace, light crossbow, case with 10 crossbow bolts, wooden holy symbol and 4 gp. Druid: Hide armor, heavy wooden shield, scimitar, club, sling, pouch with 10 sling bullets, holly and mistletoe and 6 gp. Fighter: Scale mail armor, greatsword, shortbow, quiver with twenty arrows and 8 gp. Paladin: Scale mail armor, heavy wooden shield, longsword, shortbow, hooded lantern, three pints of oil, quiver with 20 arrows, wooden holy symbol and 24 gp. Ranger: Studded leather armor, longsword, short sword, longbow, quiver with 20 arrows and 8 gp. Rogue: Leather armor, short sword, light crossbow, dagger, thieves’ tools, hooded lantern and three pints of oil, case with 10 crossbow bolts and 16 gp.